Hard as nails Lee Van Cleef vehicle not only boasts one of the coolest movie titles, but manages to contain multiple spaghetti western ingredients, the gunfighter plot, the revenge plot, the save-the-timid-villagers plot, the flashback to atrocity plot, without sinking into oblivion. The Ennio Morricone score is a standout, with some truly frightening moments, demonic gongs, ominous flutes, that sustain the movie's effective atmosphere. The tight, clever editing maintains a fast enough pace to fulfill most fans' appetites for violent, western mayhem, yet director Giulio Petroni keeps the action original and fresh, especially in the film's fistfight sequences. 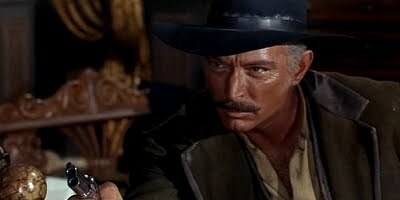 John Philllip Law seems to be delivering a John Wayne impersonation during most of his onscreen posturing, while Van Cleef provides the steely-eyed, smirky presence right up until we get to see his 42 year old, shirtless build. Some sloppy zooms mar what is essentially a nicely photographed western. Luigi Pistilli makes the unlikely choice to appear as a greedy scumbag politician. The usually sinister Romano Puppo plays a lawman.